WARSAW, Poland, November 20, 2013 (ENS) – UN Secretary-General Ban Ki-moon today called on government leaders to prioritize the environment in domestic politics and contribute to climate financing as a way of moving towards a new global climate change agreement by 2015. “This can do more than anything to unlock the huge investment necessary for climate change adaptation and mitigation,” Ban told a ministerial-level meeting on the margins of the UN-led climate change negotiations underway in the Polish capital. The high-level ministerial portion of the Warsaw talks opened Tuesday and will continue through the rest of the week, culminating in an outcome document scheduled to be agreed on November 22. Today heads of government and ministers considered progress made in mobilizing long-term climate finance, including efforts by developed countries to scale up finance. “We must send the right policy signals,” Ban said. Ban said the development of high-impact opportunities would unlock clean energy investments, close the viability gap between green projects and fossil fuel projects and remove risk from renewable energy and low-carbon investments. “Smart public financing can encourage local and international private investments,” said Ban, urging investors and companies to join forces with the public sector. Ban today also met with chief executives and senior representatives attending the inaugural Caring for Climate Business Forum being held in Warsaw alongside the UN Climate Change Conference. The Forum was launched by UN Global Compact, the secretariat of the UN Framework Convention on Climate Change, UNFCCC, and the UN Environment Programme. Speaking in the plenary session, Ban called for support to the newly established Green Climate Fund, which functions within the framework of the UNFCCC. It is intended to be the focus of efforts to raise climate financing for developing countries of US$100 billion a year by 2020. Based in the new Songdo district of Incheon, South Korea, the Green Climate Fund aims to enable countries to develop the capabilities and institutions needed to use climate finance effectively. Ban described the current state of the new Green Climate Fund as “an empty shell” and called for it to be brought into full operation “as soon as possible” so support can flow to developing countries for their efforts to mitigate and adapt to climate change. Hela Cheikhrouhou, who heads the new Green Climate Fund, said the fund is “getting ready to open for business.” The opening ceremony for the Fund’s headquarters is set for December 4 in Songdo. 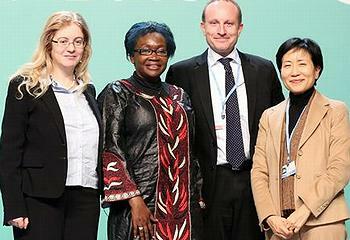 Cheikhrouhou is director of the Energy, Environment and Climate Change Department of the African Development Bank. Speaking in Warsaw, she called on the Green Climate Fund’s 24-member Board of Directors to adopt the necessary decisions for it to begin operating. She asked developing countries to identify priorities that will enable them to make requests to the fund, and she called on developed countries to contribute to the fund and catalyze private sector contributions. Delivering a keynote address, UK economist Nicholas Stern warned that “government-induced policy risk” is the biggest barrier to private investment. 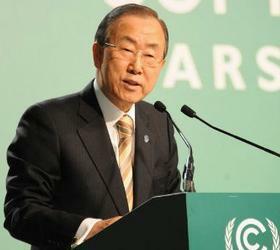 He called for increased support for the greening of development in poorer countries. 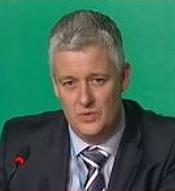 In the high-level discussion on climate finance today, COP19 President Marcin Korolec, Poland’s environment minister, urged called on governments to make progress in Warsaw on adaptation finance, predictability and mobilization from a broad range of financial sources. Tanzanian President Jakaya Mrisho Kikwete emphasized the need for funding to the least developed countries, improved transparency, harmonized financial procedures and access to financial resources. Naoko Ishii, head of the independent financial organization Global Environment Facility, GEF, emphasized that transition to a low-carbon economy requires finance and pointed out that public finance can play a catalytic role in unleashing private sector potential. Todd Stern, U.S. Special Envoy for Climate Change, who leads the U.S. delegation, also stressed that collaboration among donor countries to strengthen public finance can be an effective means to leverage private investment. G77+ China negotiator Juan Hoffmeister walked out of a negotiating session today when developed country delegates failed to endorse his proposal that compensation for loss and damages from climate change is needed now and not after 2015 when a new climate change agreement is scheduled to be signed in Paris. Russia’s climate envoy and presidential adviser Alexander Bedritsky repeated his country’s position that a separate loss and damage mechanism is not needed and that the new agreement should be based on the principles of the UN Framework Convention on Climate Change. 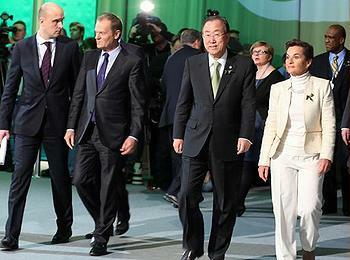 The leaders of many developing countries called for a clear political commitment on scaling up financing, both public and private; a credible pathway to the $100 billion annual financing agreed for the Green Climate Fund, with mid-term targets and milestones, and a political process to evaluate progress. Secretary of State Edward Davey of the United Kingdom announced new contributions totaling £125 million to the Least Developed Countries Fund and the BioCarbon Fund. Many developed countries, including Canada, Japan, Norway and New Zealand, highlighted mobilizing private finance, with the European Union and Switzerland emphasizing the need to create partnerships between developed and developing countries. The European Parliament delegation, led by MEP Matthias Groote of Germany, is pushing for binding commitments. In a resolution voted in October, the European Parliament reiterated the EU’s offer to increase its emission reduction target to 30 percent of 1990 levels by 2020 if other major emitting countries commit themselves to comparable goals. Groote said, “We want real pledges from all regions in the world. We want to move forward now and not in 2018 or 2020. 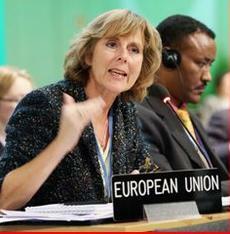 We have to keep Paris 2015 in mind, and we have to push for binding commitments from developing countries too. “In Warsaw, we must agree to prepare strong pledges for the 2015 deal and to step up emission cuts over the rest of this decade,” she said. 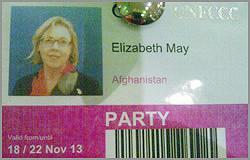 An unusual situation developed in Warsaw on Monday when Green Party of Canada Leader Elizabeth May joined the Afghanistan delegation to the COP19 UN climate conference. She will thus have access to high-level negotiations open only to government representatives. An environmental lawyer and climate policy expert and a Member of the Canadian Parliament, May says her presence on the Afghanistan delegation is expected to increase the negotiating capacity of this war-ravaged developing nation. May, along with a number of other delegates and civil society representatives, is fasting along with Yeb Sano, the leader of the Philippines delegation. Sano is on a hunger strike in solidarity with the victims of Typhoon Yolanda/Haiyan, a disaster widely attributed to climate change. The November 8-9 storm claimed at least 2,500 lives and left 660,000 others homeless. Sano said he is fasting to motivate all delegations to make meaningful commitments to limit their greenhouse gas emissions.